If you kids like to crawl around and build forts then this play hut could be perfect for them. This is a little Sofia the first castle with of course a big picture of Sofia on the side and a little tunnel and other secret entrances to the inside of the play tent. And this structure also has a little book shelve that can hold light items like the two secret storage books that are included with this kids toy. 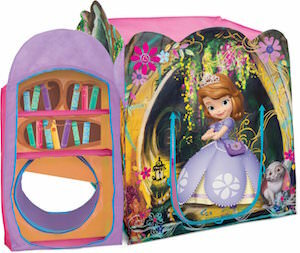 The Sofia The First tent is 3 feet high and rated ages 3 and up. Yes kids are gone love playing in this tent and keeping their toys in their to so out of sight means less of a mess elsewhere. How much fun would it be to have a tent that looks like Thomas the Train? I am sure kids will love it and that is why there is this fun play tent that looks just like the real Thomas and kids can go inside and play. 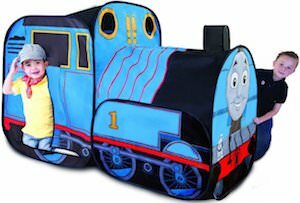 This Thomas the Tank Engine tent is easy to setup and take down and it even comes with an easy storage bag so that you can take it on trips. Just imagine how much fun it would be to have a (kids) life-size Thomas that you can play in. If I was little I would want one. If you are looking for the perfect present for you kid then come see this Thomas The Tank Engine Play Tent. If you love Doctor Who and enjoy role playing your favorite episode or you just need all of the cool collectables from the hit TV series Doctor Who then this is somethong you will not think twice about. Have a look at this Doctor Who Tardis tent, yes it stands up and has all of the features you find on the Tardis aswell as an inside that may be bigger on the inside …. you will just have to try it out. But one thing is for sure the inside of this Tardis is decorated just like the one the Doctor uses on TV. 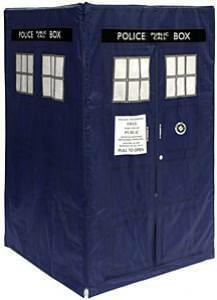 Made from a very durable and strong canvas making this Tardis tent last a long time it stands a total of 61 inches and has many uses, just get a little creative and imaginative. Your kids are gone love you even more when they see the new bed you got them. This is a Cars Tent Bed. Yes Lightning McQueen and his friends love your kid to sleep in the racing environment they live and this bed makes it happen. The bed is made for kids between 18 month to 5 years and with a maximum weight of 50 lbs. The tent on top does not have to be attached to the bed but of course make the whole Cars experience even more fun. A standard crib size mattress fits in the frame (mattress sold separate). The bed frame is made of metal and the bed ends are plastic to make the whole bed sturdy but still light. The bed is also pretty low so that you kid can get in and out easily. And this bed meet all the JPMA safety requirements so that you don’t have to worry about the safety of your toddler. 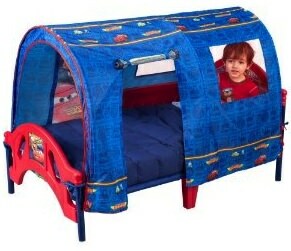 Wait no longer and start the race to get this cute Cars Tent Bed.